Perfect pools are a picnic with the power of Pool Pal! 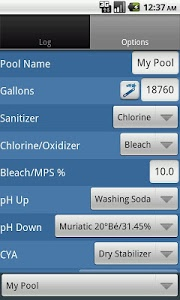 Save time and money by keeping your pool water properly balanced. 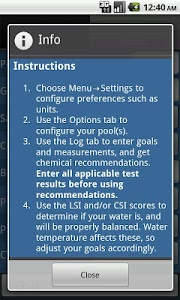 Enter goals and test results and Pool Pal will recommend chemical quantities. 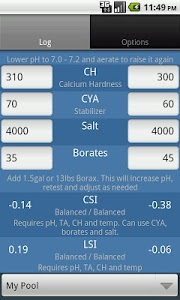 Tracks free chlorine, bromine, hydrogen peroxide, pH, total alkalinity, calcium hardness, stabilizer, salt, borates, water temperature, backwashing, CC, filter cleaning, flow, pressure, and TDS. 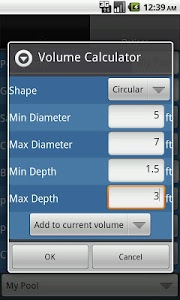 Supports multiple pools and includes a volume calculator. 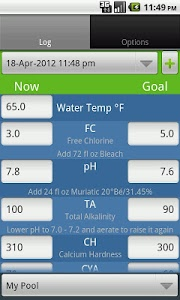 Pool Pal displays the Langelier Saturation Index (LSI) and the Calcite Saturation Index (CSI) for current readings and goals. These indices can be affected by water temperature, so PoolPal makes it easy to adjust your goals for perfectly balanced water. 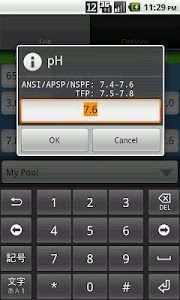 Keywords: pool maintenance, pool calculator, pool chemistry, pool testing, pool chemicals, spa care, spa maintenance, spa calculator, spa chemistry, spa testing, spa chemicals, simple pool, pool pro, pool care, swimming pool. Data copied to public storage so you can transfer your data to a new device.